When learning how to make a roast beef you will find it is not necessary to sear a roast at a high temperature to achieve an attractive brown crust. This can be accomplished just as easily by maintaining a constant moderate temperature throughout the cooking period. It requires less time and energy and requires less attention to the spattering of fat from the browning. 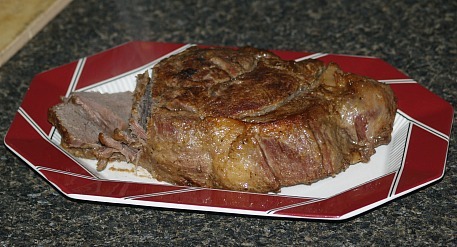 You need to know the cooking time for beef when learning how to make a roast beef. This means knowing the length of time necessary to cook a roast of a given weight of meat and a given temperature of the oven. Figures given in a time weight chart can be used only as a guide since the length of time necessary to cook a roast depends on several factors. Heat penetrates more slowly to the center of a square chunky roast than to the center of an oblong roast of the same weight and cut. 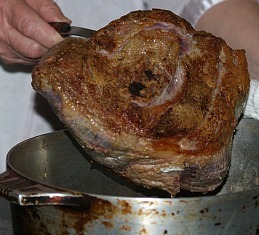 Boned and rolled roasts require more minutes per pound of cooking time than do standing roasts with the bones left in. Small roasts require more minutes per pound than do the larger ones. Heat penetrates more slowly into roasts containing a good amount of fat than into leaner roasts. With so many variables to be taken into account, no time roasting chart can be taken exactly literally. When learning how to make a roast beef take these many variables into consideration. They do, however, offer a good guide to follow to allow for a good estimate of time. When learning how to make a roast beef, also learning to use a meat thermometer offers a much better way of determining when your roast is ready to be removed from the heat. When the thermometer registers the internal temperature of the roast, the temperature indicates the exact stage of roasting that you are trying to achieve. Time charts with temperature readings will assure you that when the roast is removed from the oven you have reached the correct stage of doneness. The procedure of testing for doneness when you know how to make a roast beef is much the same for all meats but different meats must be cooked to different degrees of doneness. 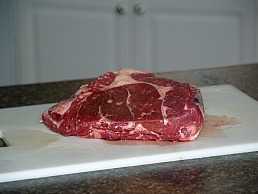 Beef is often preferred to be cooked to rare or medium rare whereas pork, lamb and veal are always medium to well done. Rare roast beef is uniformly rosy red in color with just a narrow edge or border of gray. It should be attractively browned on the surface. Medium rare roast beef will have less juice and the juice will be lighter in color. The cut slice will be light pink in color throughout with a little water edge of gray. Well done roast beef will have still less juice and the juice will be slightly yellowish in color. The cut slice will be grayish brown throughout. The roast will be less full and plump than those cooked to the rare or medium rare stage. Temperature is important when learning how to make a roast beef. Use a moderately low oven temperature; 300F degrees to 350F degrees. 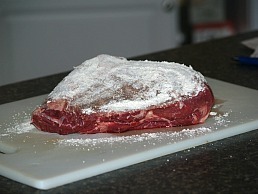 Use a shallow uncovered roasting pan; sometimes you will cover to make a pot roast recipe but follow directions. 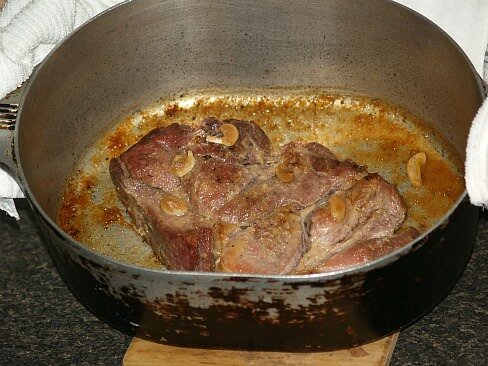 Place the fat side up in the pan, preferably on the rack in the pan; if the roast does not have a natural layer of fat, have the butcher supply one. The fat melting down the sides will replace the necessity of basting the roast. Use a meat thermometer to test for doneness. Making sure the thermometer does not touch bone or fat; insert it into the center of the largest muscle of the roast. Unless recipe instructs you to do otherwise, do not sear the roast, add water to it, cover or baste the roast. Friends ask me all the time how to make a roast. Sometimes I do like to sear or brown some types of beef roast before placing in the oven. 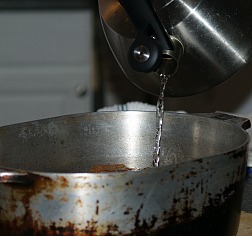 This process will seal the juices and also add a rich flavor to the gravy made with the broth. I like to dust some roast like the round and chuck with seasoned flour and then brown both sides in a Dutch oven in hot oil. Afterwards I add a little water, cover and place in a slow oven until tender; depending on the size about 1 ½ to 2 ½ hours. 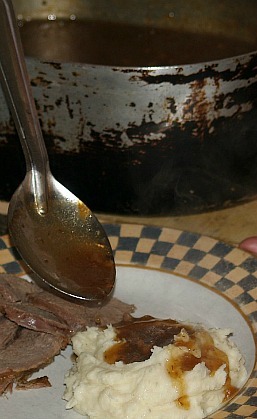 Skim off the fat from the roast retaining 2 tablespoons of fat for each cup of gravy required. Add 1 to 2 tablespoons of flour for each 2 tablespoons fat. Blend the fat and flour over low heat until it is a rich brown color. Stir frequently being careful not to scorch. When brown remove from heat and gradually stir in cold liquid (water, stock, milk or vegetable juice); one cup for each 2 tablespoons fat and flour. Season with salt, pepper and a little garlic powder or onion powder. Return mixture to heat and cook until thick and smooth, stirring constantly. 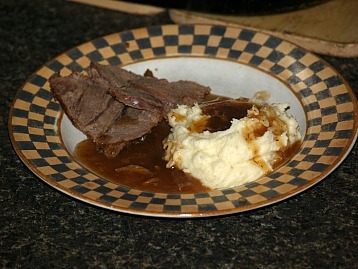 When you know how to make a roast beef you will also want some great leftover recipes like this one. I added spices and pine nuts to give it a Middle Eastern flare. 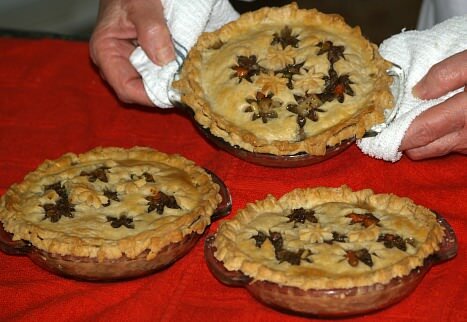 I had 5 small pie crust in my freezer which I wanted to use; I used 2 for the top crust of 3 pies. This filling will also fill a 9 inch double crust. Put olive oil in a large skillet or pan; add beef, onion, mint, cumin, all spice, salt, pepper and pine nuts and set aside. In a saucepan, stir broth into flour until smooth; heat to a boil stirring until thickened and set off. Add drained vegetables to skillet; quickly heat while stirring. Pour thickened broth mixture into skillet stirring a few minutes just until bubbly. 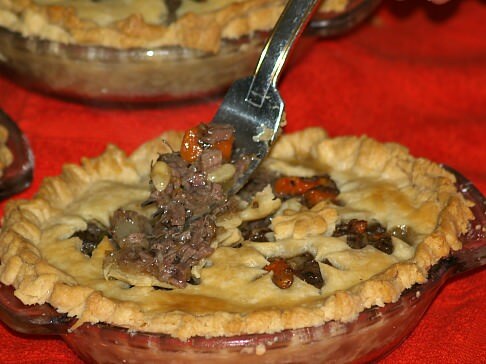 Spoon into pie shells and cover with top crust; bake 25 to 30 minutes until crust is golden brown.